Rehana’s full-length plays have been produced/developed at: Asian American Theater Company (San Francisco), Arena Stages (Los Angeles), Theater Row (NYC), HERE Arts Center (NYC), Rasik Arts (Toronto), and Asian American Arts Centre (Philadelphia). Her play, Barriers, was published with the Alexander Street Press, and was on the theater curriculum at Berkeley, West Virginia University, and Yale University. Her short plays have been presented at the Culture Project, The Flea, The Tenement Museum, Richmond Shepard Theater, Artwallah (Los Angeles), CSV Center (2G), and Abrons Arts Center. They have been published with the Alexander Street Press as well as in The New York Theater Review, with Blue Box Productions Best of Sticky Series. She is the current Lark/IAAC South Asian Playwright in residence, a resident artist of 2G, and resident member of Ma-Yi Theater’s Writer’s Lab, as well as the recipient of a LMCC artist grant, EST/Sloan Commission, Leopold Schepp Award, John Golden Award, and 2008 TCG Future Leaders mentorship with New Georges/Susan Bernfield. She’s been a finalist for Sundance, Eugene O’Neill Playwrights Conference, and a Princess Grace Fellowship. 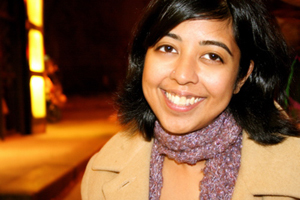 Rehana is also the founder and Artistic Director of Desipina Productions (www.desipina.org), a South Asian and Asian American theater company dedicated to new works. MFA: Playwriting, Columbia University; BFA: Dramatic Writing, New York University, Tisch School of the Arts. Sunima returns home to announce her pending engagement, but instead gets trapped in the family loss they never dealt with. As this multi-cultural, Muslim family begins to fragment, we begin to piece together the past each one hides, and the future they all share. A semi-serious comedy about a radio show that wakes up New York with frivolous pranks, and the intern who comes along to reform it, one fart joke at a time. An atheist clubkid, Nora, and a sheltered Muslim girl form an unlikely friendship. When circumstances lead them to becoming roommates, the personal becomes political. In a newly formed boutique water company, an odd assortment of individuals come together. As the global economy becomes increasingly smaller, each individual comes to face what they are willing to give up in the pursuit for happiness.